Title: May Day Street March: Immigrant Rights NOW! Join the People's Congress of Resistance, the Full Rights for All Immigrants Coalition and many other groups on May 1st at 1:30PM on the corner of Olympic and Broadway as we march to gain immigrant rights through people power! May 1st is celebrated as International Workers Day, revived in the U.S. in 2006 when millions of Angelenos marched in the streets of downtown L.A. lead by immigrant workers, to fight for workers, immigrants and all oppressed people. THIS YEAR we demand an end to: attacks on unions, ICE raids, police brutality and sexual harassment in the workplace. We call for an end to imperialist wars abroad which devastate innocent people and the planet. We strive for a society with justice for women, students, LGBTQ folks, and the environment. We salute the striking teachers and student walk-outs across the country who are demonstrating that when we are organized we have the power. We encourage everyone to take the streets and build a movement to create a congress and new system that is representative of the people. A 'society for the many' is our vision for revolution! please endorse and promote this event and see you in the streets Tuesday, May 1st! It is clear that we cannot rely on Congress for change. For decades Congress, under both the Democrats and Republicans, has refused to pass legislation that permanently protects our immigrant community. Democrats attempted to co-opt the 2006 movement, while continuing to foster an atmosphere of hatred and repression against immigrant families. Last year, over billion of taxpayer money was spent on ICE arresting, detaining and deporting undocumented immigrants. Today, nearly six months after Trump announced the cancellation of DACA, Congress has yet to make a decision, affecting 800,000 undocumented youth immigrants. May 1st is celebrated around the world as International Workers Day. 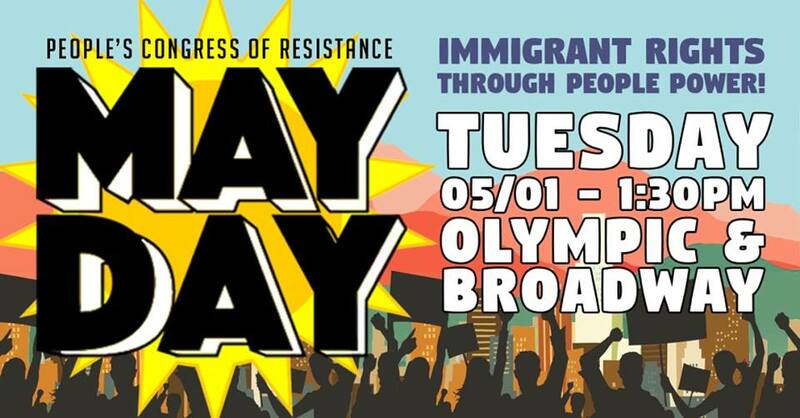 After May Day's revival in the U.S. in 2006 when millions of people went on strike lead by immigrant workers, each year, on this day we continue to fight for workers, immigrants and all oppressed people. We demand an end to the attacks on unions, ICE raids, police brutality and sexual harassment in the workplace. We call for an end to imperialist wars abroad which devastate innocent people and the planet. We strive for a society with justice for women, students, LGBTQ folks, and the environment. We salute the striking teachers and student walk-outs across the country who are demonstrating that when we are organized we have the power.